One brain inju ry occurs every 15 seconds and it is the leading cause of death in the United States for individuals under the age of 34. In the Knoxville Metropolitan area there are about 1,000 moderate to severe brain injuries admitted to hospitals. our neighbors at RMH in honor of brain injury awareness month on Monday, March 8th. The group worked on an art project with funding from the East Tennessee Foundation and Ft. Sanders Foundation arts initiative grant. 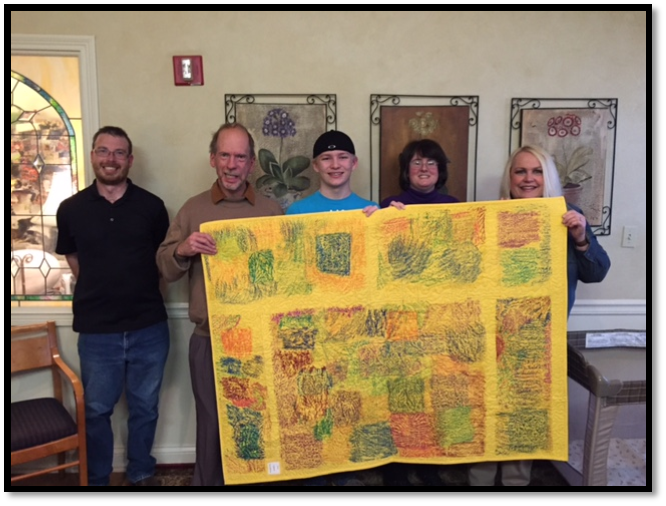 The artwork was turned into a quilt that they donated to the Ronald McDonald House. The group also showed a proclamation from Knox County Mayor, Tim Burchett, announcing March as Brain Injury Awareness Month. The Patricia Neal Rehab was the first CARF accredited brain injury program in the state of Tennessee.